In a sea of square favor boxes, these shell-shaped personalized seashell acrylic favor boxes really stand out! Ideal for a beach-themed bridal shower, wedding or summer party on the sand. 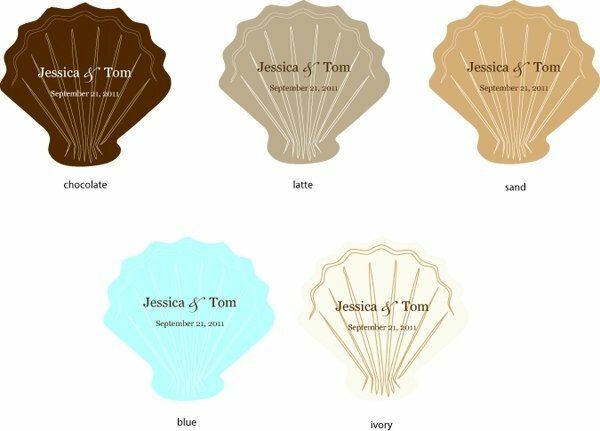 Each clear, acrylic favor box can be personalized with a shell-shaped label in your choice of colors: chocolate, latte, sand, blue or ivory. Up to two lines of custom text can be printed on each (maximum of 16 characters on the first line; 18 characters on the second line). Labels arrive separately; some assembly is required. Candy not included. Shell boxes measure 3.5"L x 3.25"W x 0.75"D.
Want to fill your seashell favor boxes with love? Slip a handful of mini hearts wedding favor candy inside or pick mints or sweets from our selection of wedding candy.